The General State Budget (OGE) for 2018 was sent yesterday, September 10, by the National Parliament to the President of the Republic, Francisco Guterres Lu-Olo, for promulgation. The OGE was approved last Friday by the National Parliament by a large majority after six days of specialty discussion with the debate and analysis of almost 100 proposals to amend the document. 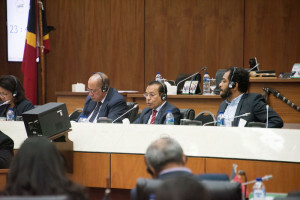 The draft Law of the General Budget of the State was delivered by the Government to the President of the National Parliament, Arão Noé Amaral, on August 7, 2018, just over two months after the swearing-in of the Eight Constitutional Government, with Prime-Minister Taur Matan Ruak justifying the urgency of the entry into force of this budget "not only because of the need to secure the financial and budgetary resources necessary for the good provision of public services, but also to re-establish confidence in our economy without delay with the private sector more dependent on the investment or expenditure of the State". The budget foresees a total expenditure of US $ 1,277.372 million, distributed mainly in the categories of Salaries and Wages, totaling US $ 200.253 million, Goods and Services, totaling US $ 354.031 million, Public Transfers of US $ 324.222 million, Minor Capital (US $ 5,117 million) and Development Capital (including the Infrastructure and Loans Fund), with US $ 393,748 million. The maximum total amount approved for financing through public debt is US $ 61.6 million. The total expenditure on services with no administrative and financial autonomy and autonomous agencies without own revenues is $ 830.54 million. The total expenditure on services and autonomous funds in 2018, including expenditure financed by loans, is US $ 431.035 million. The total expenditure estimated for the Special Administrative Region of Oé-Cusse Ambeno (RAEOA) and the Special Zones of Social Market Economy of Oe-Cusse Ambeno and Ataúro (ZEESM) is US $ 28,000 million to be financed through the endowment of the OGE in the amount of 27.076 million US dollars. The total amount of revenue is US $ 1,277.4 million, which includes US $ 188.8 million of non-oil revenues including revenues from autonomous funds and services, US $ 982.5 million of transfers from the Fund Petroleum, US $ 61.6 million of loans and US $ 44.4 million relating to the use of the Treasury Account balance. The Ministry of Health has an estimated a total expenditure of US $ 42.709 million, for a sector where the Government will focus on improving health care throughout the country, with special attention to remote areas and to the most disadvantaged, poor and vulnerable groups, contributing to the principles of inclusion, equity, efficiency and quality, optimizing material and human resources, investing in training, capacity building and performance evaluation. In the sector of ​​education and training, the OGE is distributed by the Ministry of Education, with a budget of USD 76.339 million (including the Secretariat of State for Youth and Sport), by the Ministry of Higher Education, Science and Culture, with an estimated value of US $ 3,211 million (including the State Department of Arts and Culture) and the Human Capital Development Fund with US $ 15.794 million. In this sector, the Government intends to carry out reforms in the management and administration of the education system, to increase the number of children with access to pre-school education, to solidify the conditions for a education system that is universal, compulsory, free and of better quality, to strengthen the conditions of a secondary education system where scientific, humanistic and technical knowledge is promoted, to strengthen the mechanisms for accreditation and quality evaluation of higher education and to ensure that it responds effectively to the needs of the labor market. In the sector of ​​social inclusion, social protection and solidarity, the OGE for 2018 provides for the Ministry of Social Solidarity and Inclusion a total expenditure of 52.232 million US dollars, for the Ministry for the Affairs of National Liberation Combatants an expenditure of 100.829 million dollars and for the Secretary of State for Equality and Inclusion, US $ 684,000. In this area, the Government will continue to support the poorest and most vulnerable citizens and develop policies and strategies that reduce dependence on State support. The Government will also continue to recognize the inestimable value of national heroes, to preserve and celebrate the memory of the struggle and to ensure that all those who have lived with sacrifice to achieve the common good can now live in dignified conditions. It will also carry out a set of measures to ensure the economic independence of female heads of household, women victims of domestic violence and gender-based violence, and to promote equal opportunities for women to have access to decision-making positions, and justice and security. In the infrastructure sector, the Government provides in the 2018 budget for the Ministry of Public Works a total amount of US $ 101.405 million and for the Ministry of Transport and Communications a total of US $ 2.076 million. This sector is the central pillar of the Government's strategic development plan as it is crucial to economic and social development, especially to sustain productive activities, contributing to job creation, economic diversification and private sector development. In this way, the Government will act with great rigor in the planning, monitoring, inspection and evaluation of the different projects, to ensure they are implemented effectively, efficiently and with quality as well as their good use, conservation and maintenance and relationship between costs and benefits of development. In the economic sector, the OGE includes a total of US $ 836,000 for the Office of the Coordinating Minister for Economic Affairs, US $ 10.032 million for the Ministry of Planning and Strategic Investment, US $ 5.532 million for the Ministry of Tourism, Trade & Industry, US $ 7,016 million for the Ministry of Agriculture and Fisheries, US $ 12,808 million for the Ministry of Petroleum and Minerals, US $ 2,045 million for the Secretariat of State for Vocational Training and Employment, US $ 694,000 for the Secretary of State for Cooperatives and US $ 695,000 for the Secretary of State for the Environment. The Eight Government program for this sector foresees a set of measures aimed at diversifying the economy, strengthening the private sector, promoting territorial cohesion and the emergence of different poles of development capable of boosting national development. During its mandate, the Government intends to create and stimulate a safe and secure environment conducive to attracting new businesses and investments in the national and international private sector, focusing on three essential industries: agriculture (including livestock, forests and fisheries), tourism and oil, taking advantage, particularly of the natural, geographical or cultural potential of the country capable of mitigating dependence on oil revenues. Proposals to stimulate creativity, innovation, entrepreneurship or self-employment are also presented to increase income opportunities and improve productivity, the ability to generate wealth and establish new markets/sectors of work. In Public Finance, the Government will promote development based on sustainable financial diversification, duly supported by transparent and balanced revenues and expenditures, while remaining committed to accountability with constant communication and regular collaboration with civil society organizations. It will continue to invest in the Electronic Portals for transparency of the budget, procurement, aid and results of the Government. It will extend the Fiscal Reform to a Public Finance Management Reform that will enable revenue growth, improve procurement, strengthen financial decentralization and budgeting based on the program. The Government intends to expand Public-Private Partnerships and implement prudent and judicious management of public debts, loans and Public Funds. The Ministry of Finance will have a budget of 13.059 million US dollars. The Ministry of State Administration will have a budget of 8,354 million US dollars. For Public Administration, the Government envisages a set of measures to promote good governance and combat corruption for the development of an increasingly professional, competent and efficient public sector capable of increasing citizens' confidence in governance, implementing the main plan options and contribute as a true engine of national economic growth. In justice, the Government will invest in institutional development, improving training, coordination, planning, recruitment and training of excellence, consolidating and harmonizing legal frameworks, filling in gaps, improving regulation, implementing a bilingual model for drafting normative acts, completing the Land and Property Law package, namely with the Cadastral survey and establishing the land registry. It will also invest in the development of human resources, in the provision of adequate infrastructures, in access to justice, bringing the services of citizens closer together, progressively guaranteeing judicial existence with quality and professionalism in all Municipalities. The OGE for 2018 provides for a budget of 16,294 for the Ministry of Justice and 4,214 million for the Ministry of Legislative Reform and Parliamentary Affairs (including the Secretariat of State for Social Communication). In defense and security, the 2016 OGE includes a total of US $ 20.610 million for the Ministry of Defense (including F-FDTL) and a total of US $ 36.843 million for the Ministry of Interior (including PNTL). The Government will continue to implement a comprehensive strategic plan for modernization, qualification, professionalization and women's participation in security forces and services, bringing citizens' services closer together, encouraging risk and conflict prevention, promoting social stability, combating crime , better controlling border movements, developing civil protection, combating road accidents, implementing martial arts regulation, and continuing to invest in education campaigns for safety, training, infrastructure, facilities and equipment. It will also promote military service, increase the capabilities of the ground and naval operational components, strengthen engineering and health units, establish an Academy and plan a Military Hospital, improve command, control, communications, computer and information systems, and implement an integrated human resources development policy based on merit. In the sector of ​​international relations and foreign policy, the Government will continue to promote bilateral and multilateral cooperation, fostering cultural, economic and commercial partnerships, essential for attracting investment and for training institutions and human resources. The OGE provides for a total amount of 23,308 million dollars for the Ministry of Foreign Affairs and Cooperation. The Prime Minister, who is responsible for leading the Government and presiding over the Council of Ministers, directs and guides the general policy of the Government and all the governmental action and represents the Government and the Council of Ministers in their relations with the President of the Republic, the National Parliament and before the international community, will have a budget of 5,718 million US dollars. The 2018 State Budget includes a total amount of US $ 23.635 million to the Minister of State and the Council of Ministers (MEPCM), whose mission is to assist the Prime Minister in the Presidency of the Council of Ministers and in the coordination of the Government and assumes the functions of spokesperson for the Government and the Council of Ministers. It is also incumbent upon the MEPCM to coordinate the preparation and organization of government work, as well as to monitor and evaluate the implementation of decisions taken by the Council of Ministers and to coordinate legal support and consultation with the Council of Ministers. To read the Eight Constitutional Government Program (Portuguese) click here. To read the Organic Law of the Eight Constitutional Government (Portuguese) click here. To read the speech of the Prime Minister presenting the OGE (Portuguese), click here. To read the speech of the Prime Minister closing the presentation of the OGE (Portuguese), click here.